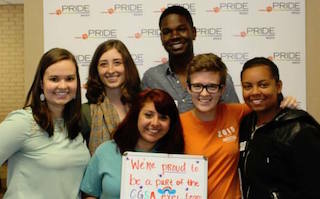 Clemson University works to support the Lesbian, Gay, Bisexual, Transgender, Queer and Questioning (LGBTQ) community through several programs, services, and advocacy efforts. Whether you are a member of the community, a strong ally, or just interested in learning more, the Gantt Multicultural Center has a program for you. Be on the look out for one of our many events that occur throughout the academic year. If you want to have our staff come speak with you or your group to figure out how we can fit your needs around LGBTQ programming, please reach out to us! The purpose of Ally Training is to make Clemson University a more welcoming and inclusive place for lesbian, gay, bisexual, transgender, queer, and questioning [LGBTQ] students, faculty, and staff. Ally Training aims to increase awareness and understanding of LGBTQ issues and to train allies to stand with, and advocate for, LGBTQ people. The purpose of Ally Training is to make Clemson University a more welcoming and inclusive place for lesbian, gay, bisexual, transgender, queer, and questioning [LGBTQ] students, faculty, and staff. Ally Training aims to increase awareness and understanding of LGBTQ issues and to train allies to stand with, and advocate for, LGBTQ people. Register for Ally Training here. As a part of National Coming Out Week, come bring your lunch or sample the Barnes Center's menu with the President's LGBTQ Commission and other LGBTQ Clemson faculty and staff! RSVP to the Facebook event here. As a part of National Coming Out Week, Sistas on the Move, CAPS, and the Harvey and Lucinda Gantt Multicultural Center will be hosting a Walk and Talk event on October 10th, 4-5 p.m. Students, faculty, and staff are invited to go on a dialogue-focused walk beginning at the front of Brackett Hall as people share their coming out stories, process allyship, and build community. RSVP for the Facebook event here. The annual National Coming Out Day Festival hosted by Clemson University's Sexuality and Gender Alliance (CU SAGA) and the Harvey and Lucinda Gantt Multicultural Center will be on October 11th, 3-6 p.m. Come out to the Carillon Gardens for games, popcorn, and friendship. RSVP to the Facebook event here. In honor of National Coming Out Week, Global Engagement, the Division of Student Affairs, and the Harvey and Lucinda Gantt Multicultural Center are coming together to bring another installment of the Global Awareness Film and Discussion series. Come out to view a film which explores and celebrates what the lived experiences of LGBTQ+ individuals are like across cultures.